The first British civilian bomb casualties are reported. Hitler halts Panzer drive on Dunkirk. Infantry units of XIX.Panzerkorps storm the citadel of Boulogne and take 5,000 British and French prisoners. The French fortress of Maubeuge surrenders, while 6th Army captures Ghent and Tournai in Belgium and St Omer in North-eastern France. Luftwaffe sink destroyer Wessex off Calais. War Weapon Week ends in towns and cities, with Â£124m collected. 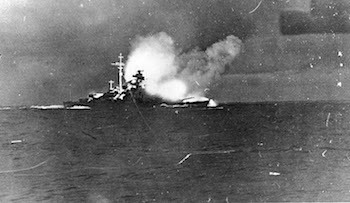 The German battleship Bismarck, supported by the heavy cruiser Prinz Eugen, sinks the British battle cruiser Hood after firing only three salvoes. There are only 3 survivors out of a crew of 1,421. The Prince of Wales is also damaged and forced to break off the action. Heavy German bombing of Crete. King of Greece leaves for Cairo. King George VI makes South African Premier, General Smuts a Field Marshal, the first man born in an overseas dominion to attain that rank. The Australian Prime Minister, R.G. Menzies arrives back in Australia after his trip to Britain. General Stilwell arrives in Delhi after a 20-day jungle trek out of Burma. The Germans decide they’ve had quite enough of the partisan harassment in Russia and launch operation ‘Hanover’, to clear the Bryansk-Vyazma railway. For six days, 45,000 German troops, including panzer and SS-police units, search for an estimated 20,000 partisans, catching or killing many of them. In the Barvenkovo salient, General Ewald von Kleist’s Panzer’s start to chop up the Russian 6th and 9th Armies. Moscow admits the loss of 5,000 dead, 70,000 missing, and 300 tanks destroyed, but the Germans claim 24,000 POW’s and 1,200 tanks. ‘Bomber Harris’ congratulates RAF Bomber Command for passing the 100,000 ton mark in raids against Germany. The battle of the Atlantic is officially concluded as won by Allies, due to the withdrawal of virtually all U-boats from the Atlantic by Admiral DÃ¶nitz, C-in-C of the Kriegsmarine after the loss of 56 boats in April and May. U.S. troops take Terracina in Italy. The retreating Germans are subjected to heavy air-attacks. It is estimated that 100,000 have been gassed at Auschwitz. Between May 16 and May 31, the SS report collecting 88 pounds of gold and white metal from the teeth of those gassed. By the end of June, 381,661 persons, which is half of the Jews in Hungary have arrived at Auschwitz. The exchange of Russian POW’s for U.S. and British POW’s begins at pre-arranged points in Germany. Japanese make a suicide paratroopers jump on Yontan airfield on Okinawa and destroy seven US aircraft.